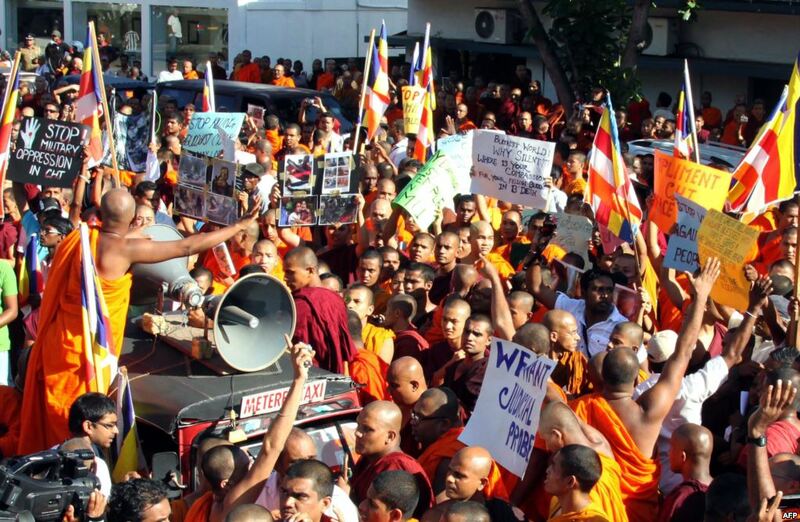 JNN 20 Jan 2014 Colombo : A group of hardline Buddhist monks is rallying Sri Lankans against Muslims. Buddhists have attacked dozens of mosques and called for boycotts on Muslim-owned businesses and bans on headscarves and halal foods in the past years. At boisterous rallies, monks claim Muslims are out to recruit children, marry Buddhist women and divide the country. In September 2011, Buddhists reportedly smashed a 300-year-old Islamic Sufi shrine to rubble in the ancient city of Anuradhapura, a UNESCO world heritage site. This entry was posted in Asia Pacific and tagged Bodu Bala Sena, buddhist monks, Buddhist Power Force, Buddhist women, Ceylon, Majority, Minority, Muslim Minority, Muslims, Rally, sacred Buddhist, Sri Lanka, Sri Lankan. Bookmark the permalink.